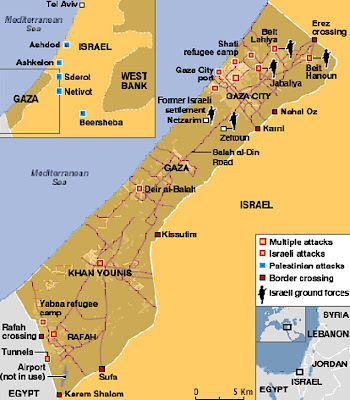 Arabdemocracy: Bloggers Bearing Witness in Gaza: Bias or Added Value to Media Coverage? Bloggers Bearing Witness in Gaza: Bias or Added Value to Media Coverage? The relationship between ‘warbloggers’ and journalists is precisely not a peaceful one. It is often caricatured - with some reason - as the encounter of frustrated failed journalists with professional ones jealous of their privileges. Donald Matheson and Stuart Allan** in a chapter entitled ‘War Zone: The Role of Warblogs in Iraq’ are thinking about the collaboration between what they call mediasphere and blogosphere. They say that blogs cannot be separated from the mediasphere to which they respond. In the case of the recent war on Gaza, it seems on the contrary, that the blogosphere was an impulse of news and the main source of information. Matheson and Allan’s model, which was applied to the 2003 invasion of Irak, could clearly be inverted as far as the 2008 Gaza offensive is considered. The lack of professional mediacy might be considered as an evidence of bias. Technically, however, the blogger is making himself available by putting his mobile phone number online, at the end of his post. Any journalist or any simple reader is invited to check the facts. Many bloggers like Mohammed kept writing, as far as they got an internet access. Hopefully, the mediasphere - not entirely - echoed the cries and stories of the blogosphere. Al Jazeera English, from Gaza, had a Twitter feed which gave the general public an opportunity to follow - and check - the news almost at the same time as a new post was published. Passing through both mediasphere and blogosphere is a way for the audience to get really involved in the news process instead of absorbing passively the crumbs delivered by mainstream media. It is a chance for professional journalists to share a conversation with this sort of active public, as well as with non-professional writers and witnesses. It is worthwhile noticing how Al Jazeera English, at some point, realized the perfect combination between blogosphere and mediasphere through an experimental platform called ‘War On Gaza. Experimental Beta’. On this website, a map was available and accidents could be submitted through the site, Twitter and mobile phones (SMS). Then, they were checked and possibly validated. In conclusion, ‘truth in a war zone’ does not depend anymore on the monopoly of information by foreign correspondents. It is more likely a dialogue between an active blogosphere and a open mediasphere that values the intelligence of its audience by putting it in the centre of the news process - in a shared rationality. *** Boyd C., (2005). "Global voices speak through blogs," BBC NEWS Technology, April 6, 2005.